If you haven’t entered to win the RWA conference tote full of books and RWA swag, you have just a few more hours! Giveaway closes at midnight tonight. Visit this post for more details. And there’s another giveaway at the end of this post for ebooks that international readers are eligible for! Yay! My first RWA conference was full of highlights, including coffee with long-time romance writer Carole Mortimer and delicious French food with Joanne Bourne, Rose Lerner, Carolyn Crane, Riptide editor Sarah Lyons and my friend and occasional co-blogger Ana Coqui. But the unanticipated gift of being able to head out to Brooklyn on Saturday afternoon with Laura Florand, author of the foodie-romance Amour et Chocolat series, and Jeannie Lin, author of the alternate history steampunk romance series Gunpowder Chronicles, to take a cake-baking class at the famous Momofuku Milk Bar was by far the foodiest thing I did while in New York. 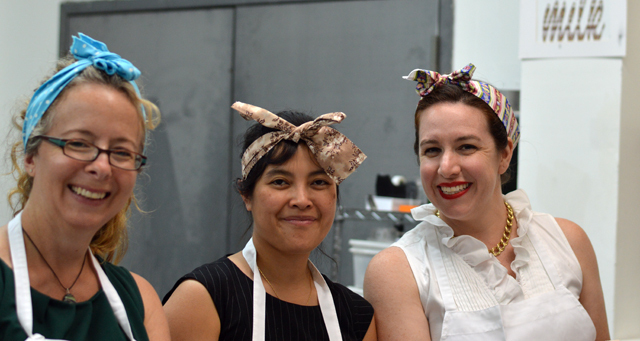 Both Laura and Jeannie are, like me, avid amateur bakers. And Laura has been in some of the finest professional pastry kitchens in the world doing research for her acclaimed series. 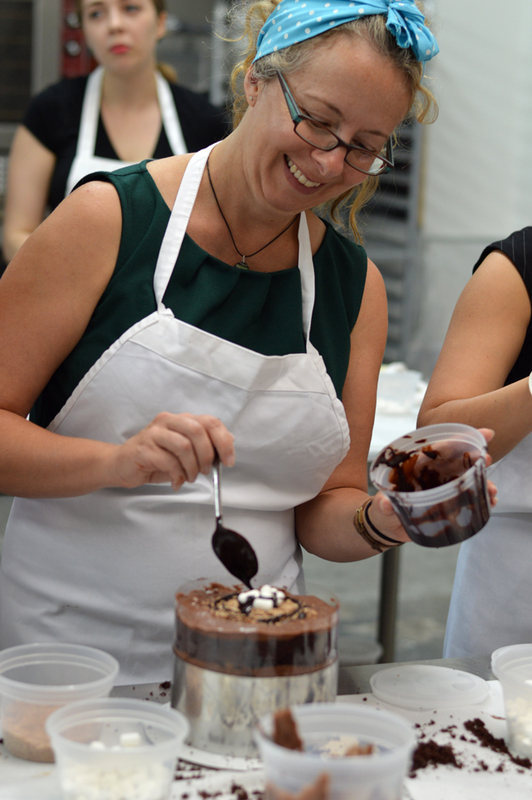 But this hands-on, “how the pros do it” class was fun for all of us. Milk Bar is most widely known for their “naked” cakes, a homey-looking style of decorating that is nevertheless a bit hard to achieve without the proper instruction and tools, some of which are amusingly low tech, like the super cheapo bent spoons they use to decorate the cakes. The biggest surprise, I think, was that Milk Bar bakes their cakes in sheet pans and then cuts the rounds out of those. I’m used to baking in round pans, but that has tended to involve various machinations to get the inside and outside of the cake to bake at the same rate. The sheet pan idea is really genius, even though the bottom layer ends up being two half layers with a bunch of scraps tucked in to make a whole layer. 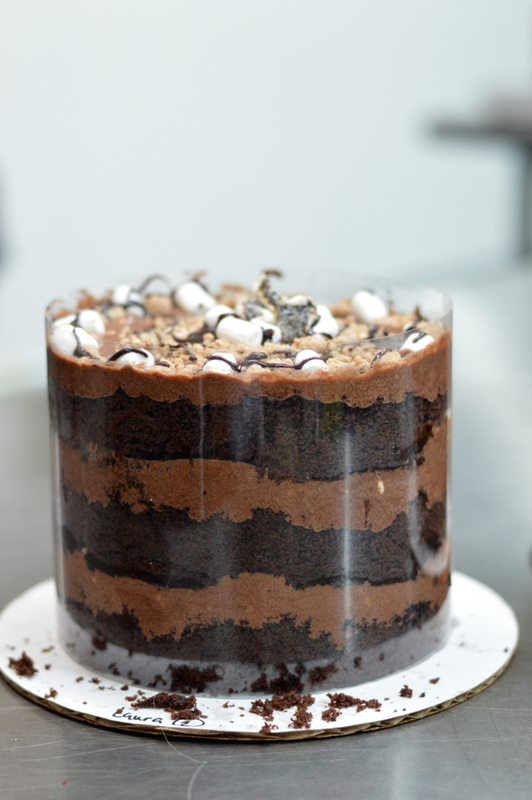 The layers of cake are intermingled with layers of “ovaltine milk”, frosting, “malt crumbs”, charred marshmallow and malted fudge sauce, with an acetate sheet holding everything together once that metal mold is removed. 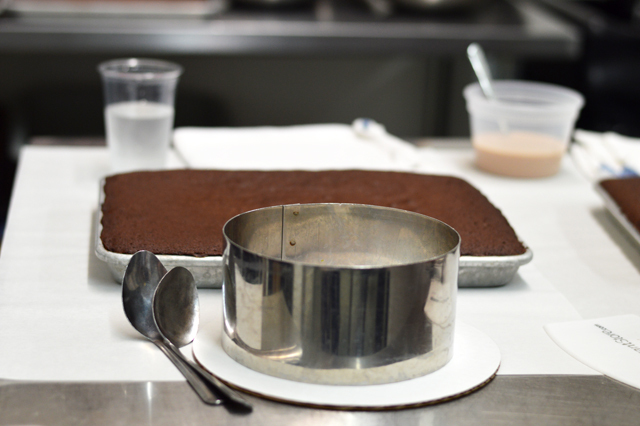 All of the elements were pre-prepared for the class so assembling the cake was a pretty simple process. Making all those individual bits would have been much more involved though so this two-hour cake assembly class probably really represents a day’s worth of baking time. Frankly though, that’s been my experience with most cakes! Both the frosting and the malted fudge sauce were layered on with bent Dollar Store type cheap spoons, a totally inspired and inexpensive way of getting around an annoying problem that I have with a lot of decorating and plating tasks. I’ve already snapped up a few at my local store! Because the sheet pan creates some additional cake scraps, the second part of the class involved making “cake truffles”, little cake pop type things made of smushed together cake scraps, white chocolate coating and the same malt crumbs that we used to decorate the cake. 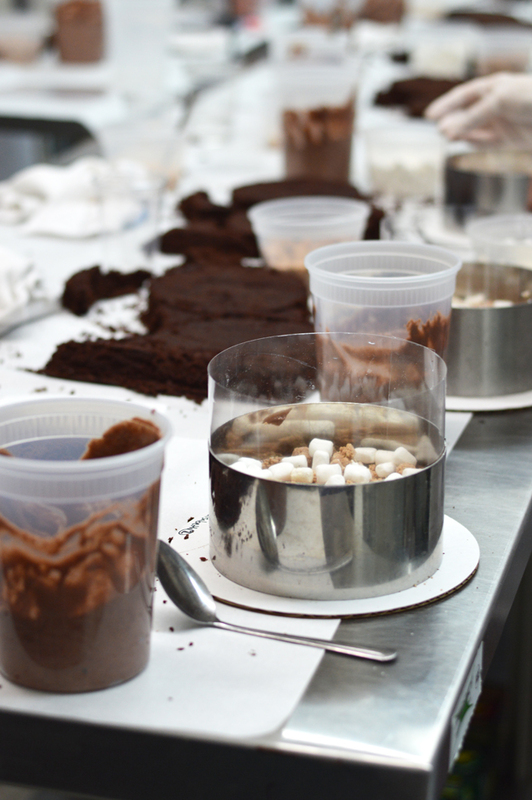 We put them together assembly-line style, just like they do in the real Milk Bar kitchen. It went surprisingly quickly! Didn’t the cakes just turn out sooo fun? 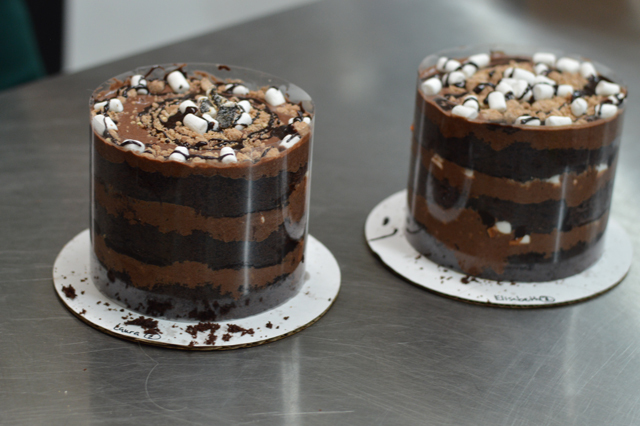 I think the layers would be a little cleaner (more like Milk Bar’s actual cakes) with a little more refrigeration time and DEFINITELY need thorough chilling before you slice into them. But part of the fun of a cake like this is the imperfection, don’t you think? A couple more notes. First, Milk Bar is opening a Washington, DC location soon so you can be sure this is not the last time you’ll be seeing Milk Bar treats on my blog and Instagram feed! Also, while pulling together the details for this post, I noticed that Jeannie Lin is launching a subscription box service for romance readers called Ever After Box! Just look at this and tell me it’s not something you desperately need in your life. Such a fab idea. I’ll sign up as soon as it’s ready to launch for sure. Finally, I promised an RWA-related giveaway for my international readers and here it is! I’ll give an electronic copy of Laura Florand’s The Chocolate Thief, the first book in the Amour et Chocolat series (OR mid-stream adjustment–Florand has a new book out today, A Wish Upon Jasmine, so if you prefer that one, I’m open to substitutions! ), and an ebook copy of Jeannie Lin’s Gunpowder Alchemy, the first book in the Gunpowder Chronicles series, from the ebook retailer of the winner’s choice. Readers in the US and Canada are welcome to enter too! This post is NOT sponsored by Milk Bar, Laura Florand, Jeannie Lin or Ever After Box. All costs were/are paid by me. Post contains affiliate links. I didn’t realize that Momofuku Milk Bar’s bakery was in Brooklyn. So that’s where you were heading Saturday afternoon! I haven’t been to any of the Momofuku locations but if I had more money, I’d definitely have hit Momofuku Ko by now. Love David Chang’s vision and the concept behind his restaurants. Yes! 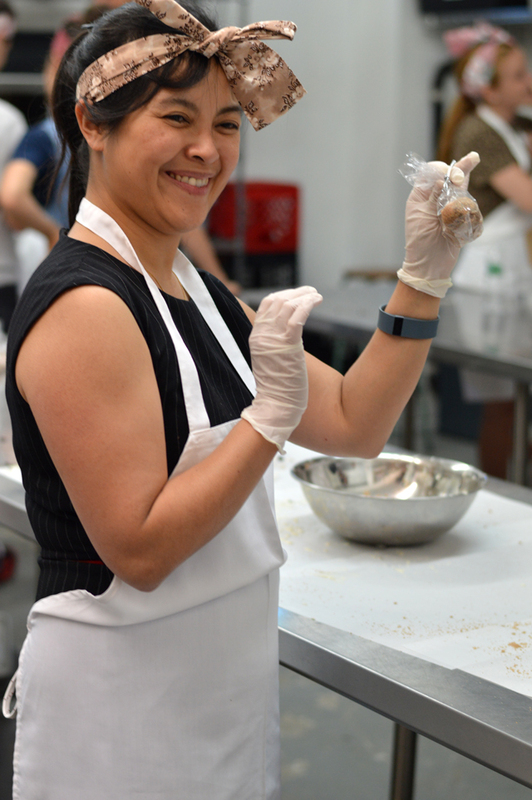 We even had to wear a hair net to walk through their kitchen (though thankfully they let us take it off once we got in the classroom). It was a very cool New York foodie experience. Your pictures turned out great, and what a fun looking class! They did! I shall have to bake in it always. I adore Laura’s series especially the Chocolate one. Talk about cravings! I love Laura Florand’s books and have been eager to read A Wish a Upon Jasmine! Thanks for the chance! What an awesome opportunity. I am in California so the only time I ever see Momofuku is on Pinterist. Wow! What a fun time! I’ve always wanted to do something like that! Great pics! Thank you for the giveaway also. Yum those look so good! Thanks for the giveaway, I love all Laura Florand’s books!! How very delicious! What a fun adventure to enjoy with book friends who love food, or is it foodie friends who love books? LOL! Looks yummy! my daughter is a chocolate fiend, so I’ll have to try this with her.